The National Council on Independent Living (NCIL) is releasing this statement to strongly condemn The Washington Times for printing an editorial on Wednesday, August 22, 2012 entitled “Holder’s ‘severe mental deficiency’”. NCIL not only condemns The Washington Times for printing the extreme and hateful rant of an obvious bigot, but also demands an apology to their readers in addition to the over 56 million people with disabilities across the United States. This editorial is more than offensive to Americans with disabilities, it is a shame and a disgrace that a news organization in 2012 would see it fit to publish such uninformed hatemongering. Not only is this agenda-driven letter smattered with political incorrectness, it is simply mean, and unnecessarily demeans and mocks people with disabilities. Regarding the Department of Justice policy on hiring individuals with disabilities, the writer certainly took the opportunity to misrepresent and exaggerate the process and its intentions, and it is not clear whether the writer is simply uninformed or intolerant. NCIL believes that there is a place for people with disabilities in the federal workforce, and will publically fight this type of hate speech. This is the type of letter that was published decades ago against African Americans and women entering the federal workforce. History proved that diversity and inclusiveness would win in America, not the angry outcries of bigots with narrow-minded arguments. NCIL and the American disability community are united in our outrage created by the publication of this editorial. We stand ready to hold The Washington Times accountable for printing hate speech, and demand an immediate apology. Future reporting should be either neutral on an issue, or at the very least present both viewpoints without resorting to gutter-level bigotry. The National Council on Independent Living is the longest-running national cross-disability, grassroots organization run by and for people with disabilities. 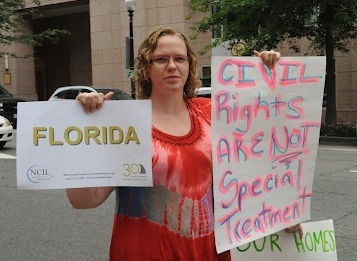 NCIL represents thousands of organizations and individuals from every state including: Centers for Independent Living, Statewide Independent Living Councils, individuals with disabilities, and other organizations that advocate for the human and civil rights of people with disabilities throughout the United States.